Firespring and Cornerstone Print & Marketing teamed with NEDCO to utilize the SBA 504 Loan Program, which enabled them to remodel the 65,000-square-foot “Gotcha Covered” building at 1201 Infinity Court in Lincoln. Growth and facility demands required more space to accommodate the overall business plan. Cornerstone offers printing and marketing services and Firespring offers innovative online tools to nonprofits. 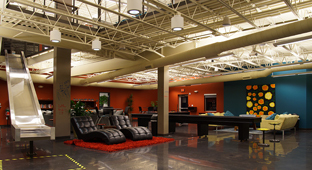 Since the move, the group has experienced a nearly 20% growth in employees. Firespring also contributes 2% of revenue to nonprofit organizations in our community and allows employees one day a month to volunteer at a nonprofit of their choice. The new facility has allowed Firespring to expand its service offering into informational technology services with the acquisition of tech firm, Floor99. In addition, since moving into the new building, Firespring has launched a payment processing platform called PaymentSpring. This service allows current and new customers an integrated solution to taking online payments and donations. 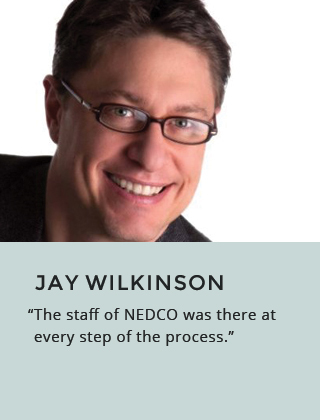 Jay Wilkinson of Firespring praised NEDCO for their expertise and responsive loan process. “The staff of NEDCO was there at every step of the process,” Wilkinson commented. For more information about Firespring or Cornerstone Print & Marketing, please visit www.firespring.com or www.cornerstoneprintmarketing.com.